A life that lacks organization can be chaotic and stressful. It can spiral out of control pretty rapidly, too. If you’re someone who desperately craves tidiness but don’t have the time to manage it on your own, you don’t have to panic. Why not? It’s because you can recruit a professional organizer (we’re near Washington, DC) to get your existence back on track. If you’re pressed for time, assistance with organizing can do you a world of good. When you need in-depth assistance with cleaning, professional organizers can accommodate you nicely. It can help to make an appointment with a consultant who represents a tried and tested company. Professional organizers communicate honestly and candidly with their clients. They ask them questions that relate to aspirations, objectives and preferences . This information can help them come up with plans that can get their clients’ lives on the right paths. A common misconception is that a professional organizer would criticize you or your clutter. They actually follow a code of ethics outlined by the National Association of Professional Organizers and would never do that. People who offer professional organization services put a lot of time into storage. They don’t insist that you throw away 50 percent of your belongings. They collaborate closely with their clients in order to devise storage approaches that are 100 percent individualized. They put together approaches that make sense with clients’ careers, wishes and habits. Professionals who work in organization are constantly on the lookout for products that can accommodate their clients well. 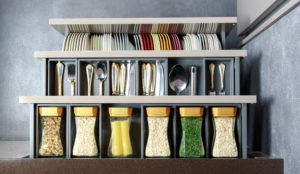 An organizer may assess your living and working spaces as a means of providing you with tips that involve products that can accommodate you to a T. A professional may point you into the direction of spacious storage bins, wall shelves and user-friendly cleaning tools. Getting your life in order can often be pretty intimidating. It can be tough to part with belongings that you’ve had for a long time. Organizers in many cases encourage their clients to throw away or donate items that they no longer need or use. Professionals regularly aid their clients by providing them with the gift of emotional guidance. Some people find parting with material possessions next to impossible. Organizers offer them guidance that’s consistent and nonjudgmental. They’re around to listen to their thoughts and concerns when they’re feeling particularly weak as well. It can be hard to track down companies that can handle all sorts of organization requests. If you require the services of housekeepers or janitors who can transform your work or living space, then you can seek referrals from organizers. An organizer can help you pinpoint a reputable housekeeping business in your area. He or she can help you locate a highly regarded dumpster rental company that’s in your neighborhood, too. Professionals who work in tidying things up are well aware of the value of routine upkeep. The absence of maintenance can make keeping order and tidiness extremely difficult. If you want to revel in cleanliness for life, strong maintenance methods are a must. Frequent upkeep can prevent issues from getting more and more out of hand with the passing of time. If you are seeking organizing services, be sure to check out The Transitional Organizer, LLC, a local company servicing Maryland, Washington DC and Northern Virginia.